No, no. That's the wrong one! Since my NSEA Protector is pretty much done, I've decided to begin another build - the 1-1400 AMT Enterprise-C! I am going to try and enter my Protector in the IPMS Region 6 ModelFiesta 37 in February. I'm gonna push myself to try and get The Enterprise-C done in time to enter it into the IPMS Houston Modelmania 2018 on 28 April 2018. Setting deadlines for myself will also help me get more than one model a year done. At least that's the plan. 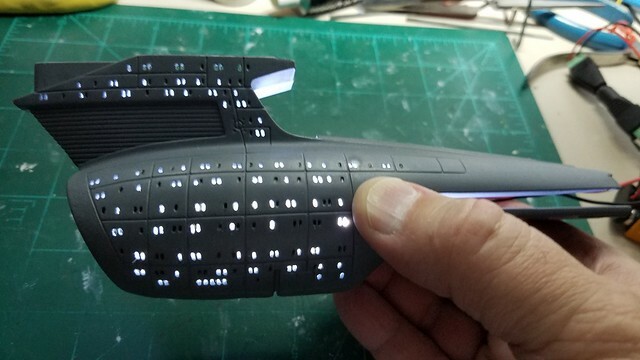 This model is a gift from my daughter, the same one that found and gifted me my first build (TOS 1/650 Enterprise), so this one has some memories attached to it as well. 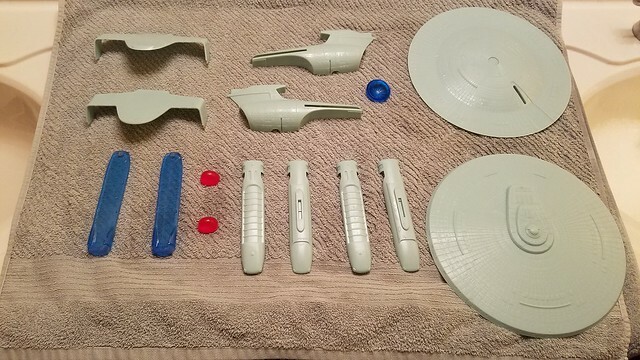 I bought the extra parts for the warp Engines and the Deflector from Don's Light and Magic as I want to do right by the build, but neither do I want to do extensive modifications to the build like I did for the TOS Romulan BoP and the NSEA Protector. I am trying to stay as OOB as I can. We will see. I plan to light it, of course, and drill out a majority of the windows. I also want to paint it more in keeping with the traditional Federation paint schema. 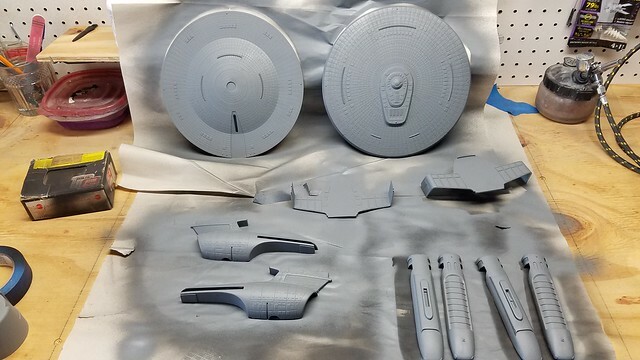 I KNOW it is canon, but just can't see painting a Starship Duck-egg Blue and white; even if the Federation is trying out a "kinder, gentler" theme. So I will be going with a grey scale theme. I also want to put blinking running lights on it and will be trying my hand at designing and making a 555 timer circuit. Tankton did the one for my Protector but I am trying to push myself to learn more. I also have an idea about the switching over of the impulse engines to Warp, but I may have to post a few questions on the site before that happens. So far I've wash the parts so they would take the primer and paint well. 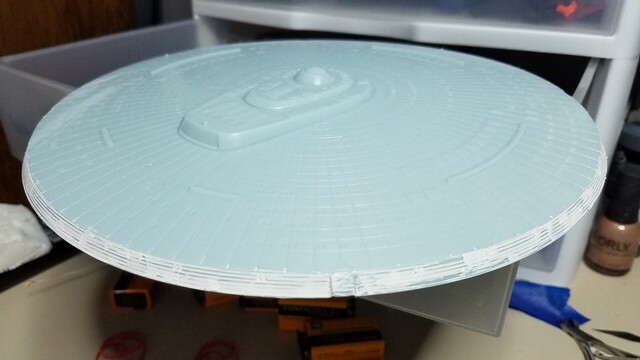 I decided to follow angyscifimodeler's lead and do something about the edge of the saucer. (If you look him up, be aware he is called "angry" for a reason!") He filed the edge of his. I am using Perfect Plastic Putty (PPP) to fill in the troughs around the rim. I was trying to fill in the troughs without filling in the windows, but it looks like I just made more work for myself. I may have jumped the gun and have put primer and flight blocking on the insides. In spraying the primer on the saucer, I have lost some definition of where the rim windows are. Again, something to work out. I probably should have cut the windows before spraying the primer, but it's already done so I will deal with it. 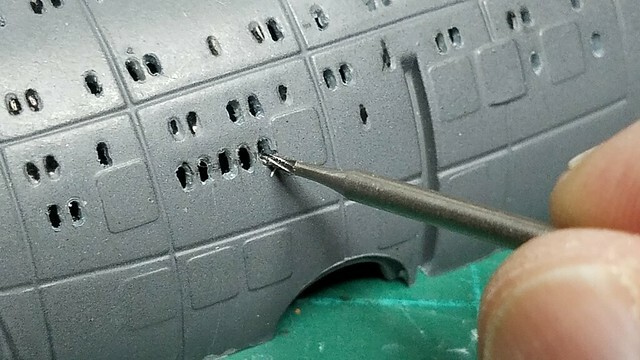 I marked the "off" windows with a permanent marker and then started drilling out windows on the secondary hull. I read where some builders drill two holes, top and then bottom, and then use an xacto blade to cut out the rest. I tried that, but am not entirely happy with the results. 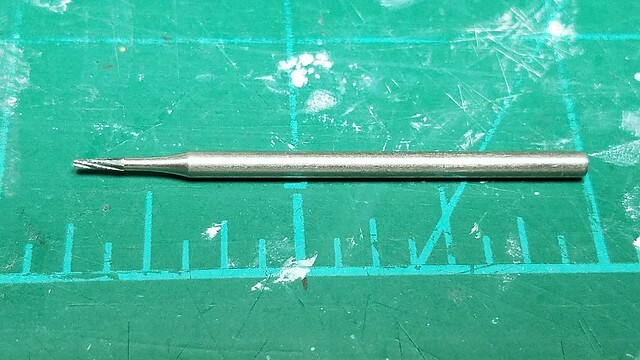 I am gonna try something with a fissure bur and my Dremel. I have a few left over dental burs I can try. If not successful, I may have to pose another question for alternative in the questions section. Anyway, that's where I am for now. May not get as much done during the holidays as I would hope, but I will post what I can when I can! Thanks for your comments and for following along with me on another build! May the wind be at our backs! Looking good so far! when i look at the windows i find them not bad at all. Its at least the same results i got on my build, and possible better at some of them. Lighting test of the secondary hull is also very sharp! So keep it up, you have made in my eyes a great start. I too am wondering if I could drill out the wide/tall shaped windows better. Makes sense to use a drill bit for either end, and then sand down the center part. 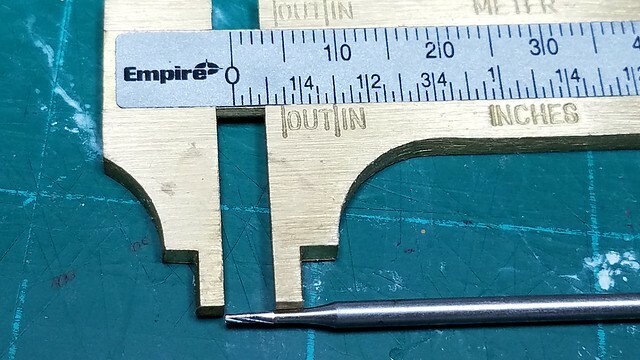 Perhaps a tiny square shaped metal file would be perfect, if the file has some tapered shape for variable size, not having to go buy some specific dimension for the cross section dimensions for the tip. You could try just carefully drag a rotating drill bit sideways between the two initial holes, but I can also see how that can go wrong and disfiguring the window hole opening. Otherwise, a small flat file should work nicely I think, for sanding down the middle part of that wide/tall widow opening after drilling out a hole on each end. navs and strobes. Here it is. This will run on 6 to 12 volts. a bur? do you have a pic of the tool you are using? Noting the DLM parts, is Don still selling? I've never had kits in his scales, but it is disappointing to see he wasn't breaking even and might have closed up shop. Thanks, Patrick! I am sorta unclear as to whether or not I want to leave them as I have to do 940 more holes (x's 2) or fix them. It is a long standing debate between my Modeler's OCD and my laziness! Decoman - as for dragging a rotating drill bit - I understand what you are saying and agree. However the dental fissure bur I have in mind should do the job a little more cleanly - if my hands can remain steady. Also, I thought about a needle file, but the smallest I have is bigger than the windows size I need to create. Do you have a suggestion for a smaller file size? TANKTON! You are the MAN! I will try and put this circuit diagram together and, if I run into any issues, I'll be sure to ask you and Patrick many questions!! Scott, yes. Yes I do now. As for DLM - I believe he is still taking and filling orders. The various forums seems to imply he is still active. I would try and contact him first; he might respond. If so, let me/us know. Matt - your post cut off so I didn't get to respond. Thanks for the interest and encouragement, guys! I appreciate the interest and comments! Awesome Steve. I was wondering what model was next. 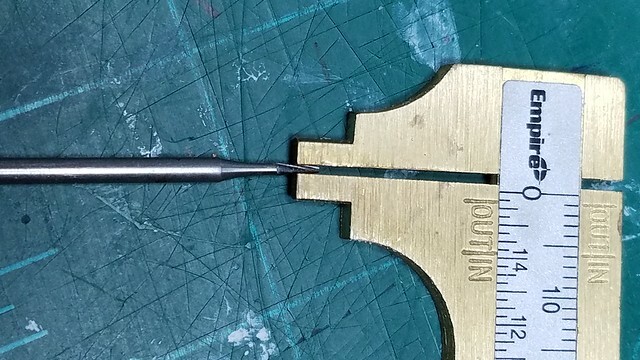 I saw a post from a guy on here that actually hooked his pen vice to a drill press somehow and then steadied the part he was drilling with a piece of wood. He would just keep the press running at the high position and move the model parts under the moving drill to drill out his windows. I thought that a pretty good idea and will give it a try when the time comes. Anyway... really looking forward to your build. Hey Steve, I am glad that you are not a modeler like myself and that you are far more linear. For me, I have so many model projects going on at the same time that I never seem to finish anything. 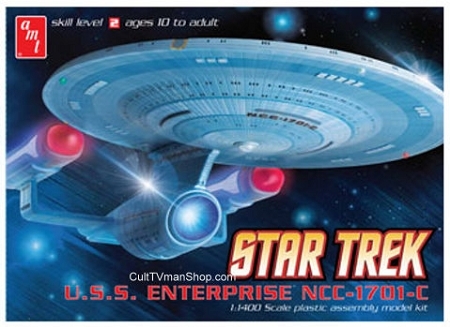 I have the Platz version of this kit (the distributor for Japan) and it comes with different options for the deflector dish (Enterprise C as well as TMP-era) as well as decals for several different ships other than the Enterprise C: Excalibur, Yamaguchi, and the Zuhkov/Zhukov. 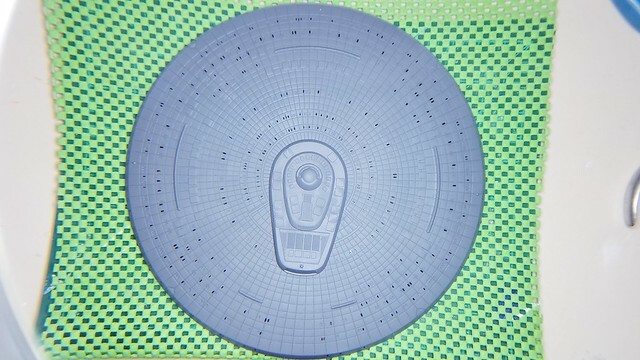 IIRC, AMT released a Yamaguchi version that has the TMP version deflector dish. That's what my Platz model comes with. I made an unboxing video of the Platz version. Since the model already comes with clear parts, I passed on DLM's clear parts. However, I did get his panel marking decals since it'll be easier to use those than to try masking them on my own. (I'm not good at masking like you are.) Since my Platz kit comes with Japanese instructions and calls for Japanese paints, out of curiosity I looked on Round2's website to see the instructions for the AMT version. It calls for Model Master Russian Flanker colors. These were only ever available as enamels, and I believe they have been discontinued along with so many other Testors enamels. I always liked the C better than the D because it was more of a combination of the A and the D.
The bur seems like an interesting idea. I'd also try drilling out the middle if you can, then cleaning up with some micro files. The drilling looks good. A grey scheme sounds just fine, on screen it looked grey anyway so it is fitting. Yeah, it was a toss up between the TOS-E 350 and this one. This one won out as I was looking for an "easy" build to do after the Protector. BUT, I also thought the TOS Romulan BoP was going to be an "easy" build too and you saw what happened there! Yeah. What's that saying "Necessity is the Mother of Invention"?! Hey Steve, I am glad that you are not a modeler like myself and that you are far more linear. For me, I have so many model projects going on at the same time that I never seem to finish anything. "Linear"?! We are all linear as we all subject to the time and space continuum into which we have been subjected. But, as the Great Doctor put it "People assume that time is a strict progression of cause to effect, but actually, from a nonlinear, non-subjective viewpoint, it's more like a big ball of wibbly-wobbly, timey-wimey... stuff." How ever you build, greg, in the end, it's always the fun that you have that matters, not the productivity! @Spencer - thanks for dropping in on the build! Those files, if they are as small as they look to be, could be what I have been looking for. Thanks for the link! @manu - thanks for the encouragement! While I have settled on the grey scheme, I haven't settled on the exact grey scale and value to use. Any recommendations would be appreciated! Thanks, Gents, for the comments, suggestions and kind words! I hope to get more done over the holidays, but will see how it goes! Good luck on this ship! Though I personally never liked the design of this ship, I always like watching people build this. I will be building a 1/1000 version of this ship when I work on my Ships of the Line set so I will be watching you! I like the work on the portholes/windows in the engineering section. "Greetings Starfighter." Hah! "It was a mobile cave, but ours never went anywhere."